Can Asymmetric Nose Be Corrected Without Nasal Bone Broken? 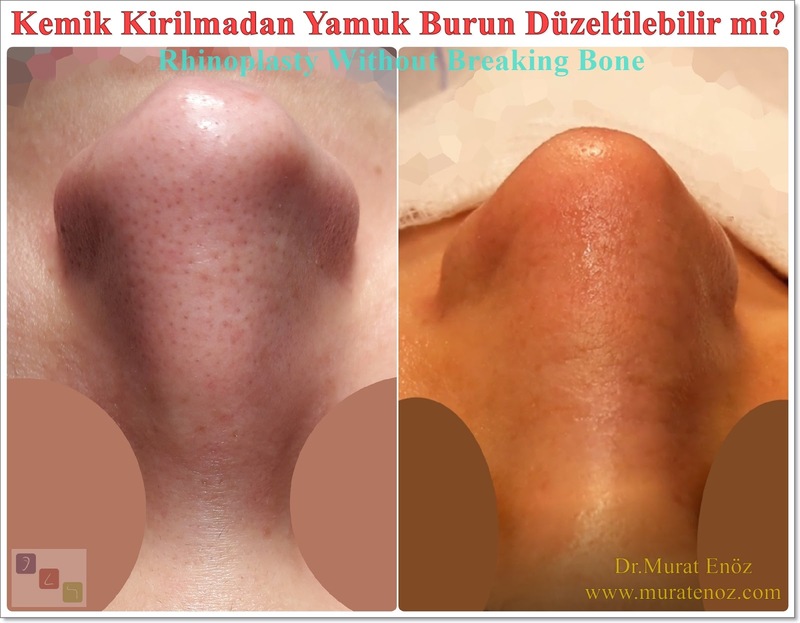 Asymmetric nose, oblique nose, deviated nose, twisted nose or curved nose, a very common situation in our country, and sometimes the rupture of the nose is not completely eliminated in nasal aesthetic surgery without bone breakage; it can be rendered very few. 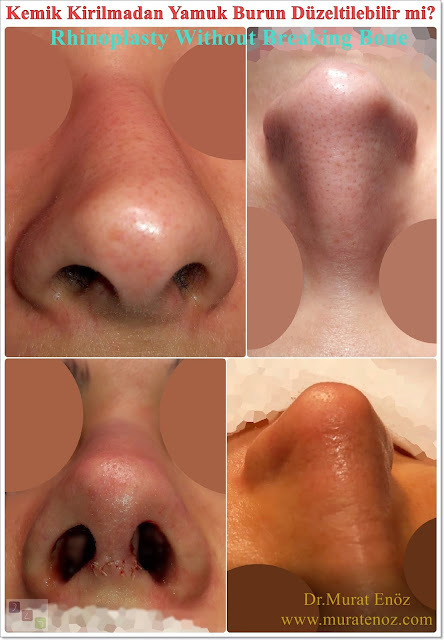 Generally due to the traumatic causes of growth in the nose of the nose back, collapse of the nose, collapse of the nose cartilage collapse, nose wings, sagging at the tip of the nose can be very different problems can occur. In fact, when the curved nose is called many different nose shape comes to mind. In the above photograph and the patient with asymmetric nose deformity shown in the photos below, because of the limited amount of the present asymmetries of the patient, bone rupture nasal surgery was performed and during the operation, curved nose treatment was performed by cartilage graft and cartilage - blood filling in the form of mutual displacement of the tissues on both sides of the nose. Here, it is not easy to obtain complete symmetry after the curved nasal surgery in the method that is performed and specially plated. "How do I get my nose fixed?" 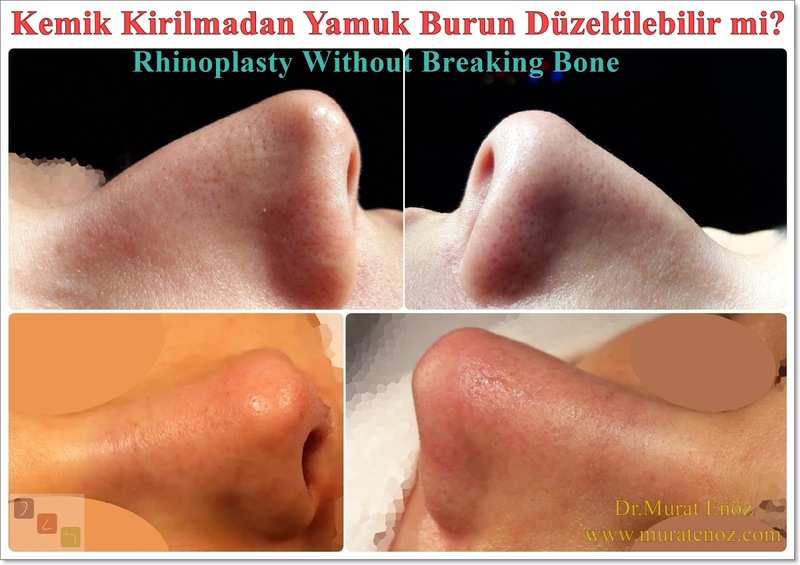 What is not to be forgotten in our patients who send e-mails and messages in the form of, is that they will need larger procedures in the curved noses of highly asymmetric structure and your doctor will recommend the best technique for you. After years of nasal trauma, it is not possible to correct permanent deformities in the bone and cartilage tissue by hand massage. Asymmetries and curvatures in the nasal bone and cartilage cannot be improved by a herbal treatment (I would like to add the answer to the question of "nasal bone curvature natural solution"). 1- Top and back view of the nose. Light reflection shows asymmetries. 2- The yellow dotted line shows the cartilage asymmetry in the supratip section above the nose flap and nose tip. 3- The red dotted elliptical nose arch area is marked. 4- The cartilaginous area of ​​the right nasal wing cartilage to be removed from the left cartilage of the nose and inverted is marked with a red dotted line. 5- The cartilage area taken from the left wing cartilage and reversed is marked with a red dotted line. 6- The left cartilage of cartilage taken from the left cartilage of cartilage to be placed in the right side of the cartilage area is marked with a red dotted line. 7- The cartilage graft area taken from the nasal septum cartilage is marked with a yellow rectangular area. 8- The area of ​​the cartilage graft to be placed on the right side of the nose is marked with a yellow rectangular area and red arrows. 9- The area where the "spreader graft" is placed on the right side of the nose is marked with a yellow rectangular area. 10- The corners of the wing cartilages at the nose end are marked with two small "X" marking. In this way, the patient had roughly nasal tip aesthetics, nasal belt filing, filling with cartilage paste, deviation surgery (and nasal turbinate reduction). The most accurate information you can get right from the point of view of the subject that is frequently asked by our patients is "what can I do to my asymmetric nose?" Symptoms of curvature of the nasal bone can usually be combined aesthetically and functionally. "I can not breathe my nose" people who consult, nasal cartilage asymmetry, alar collapse, nasal tip drop, turbinate hypertrophy can be found in a variety of reasons such as. For the treatment of deviated nose, it may be necessary to perform much larger procedures such as planned fracture (ostetomy) in the nasal bones, different cartilage graft applications, cartilage tissue from additional ribs or cartilage cartilage. Even for the treatment of collapse of the nasal wings alone, difficult and complicated procedures may be required. When planned bone fracture is performed in the nasal bones, it may be necessary to keep the nose splint and intranasal silicone splints longer than normal rhinoplasty operations after curved nasal surgery. Other than that, an important question is, "after the rhinoplasty, the crossover?" the question is. After complicated rhinoplasty or curved nose aesthetics, some of the asymmetries present before the operation may continue and the millimeter is not easy to obtain complete symmetry. Factors such as the characteristics of healing tissues, memory of the bone and cartilage tissue, and care of the patient affect the result. It is less likely that asymmetry will occur in the noses, which consist of simple nose belt files and nose-tip aesthetics and which are already symmetrical before surgery. Asymmetric nose surgery prices can be presented in a very variable manner compared to the procedures and hospitals. Since curved nose surgery prices require more labor and material than normal nose surgeries, it is natural that the price of crooked nose surgery is higher than the price of simple nose curvature surgery. It May Be Necessary To Keep The External Splint On The Nose Longer Than Normal After Crooked Nose Surgery! I performed the revision rhinoplasty operation to my collegue who had been twice undergoing nasal aesthetic surgery in Poland. She is returning back to her country one week after the revision rhinoplasty operation in Istanbul. We performed Tertiary revision rhinoplasty operation using cadaver rib cartilage. I wish happiness, luck and health in the rest of her life. Greetings from Istanbul to my all patients and friends who live at Poland. What is Revision Nose Aesthetic Surgery? Revision rhinoplasty is defined as a surgical procedure which peformed to correct problems that develop or continue to after primary rhinoplasty. Revision rhinoplasty is also known as secondary rhinoplasty or tertiary rhinoplasty, a procedure to correct prior unsuccessful surgery with the nose. Our patient who came from America and we performed ethnic rhinoplasty in Istanbul. She is returning to her country. The photo was taken 5 days after the rhinoplasty operation and the tip of the nose seems quite edematous. Little or no bruising around the eyes. Page content is for informational purposes only. The content is copyrighted. 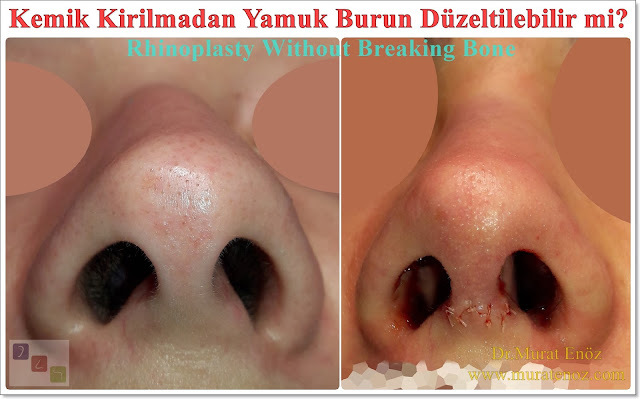 Rhinoplasty Without Breaking Bone Again! Blog Page 2 - World Health Organization (WHO) Launches "hearWHO Application"
Blog Page 1 - After A Nice Trip To Re-start A Busy Week!